The Yennek gold silver prospect is located in Tertiary igneous rocks (with extensive thin glacial cover) of the Nechako Basin. It has been explored by major mining companies since the 1980s. Geophysical, geochemical and geological mapping surveys have identified gold and silver anomalies - several remain to be drilled. The 3,650 hectare Yennek property is located 70 kilometres southwest of Vanderhoof in Central British Columbia (near Kenney Dam). 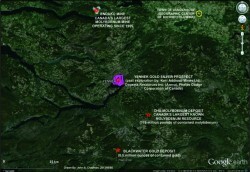 The Property is located in one of the most highly mineralized regions in B.C. - it is in close proximity to the Endako Mine (Canada's largest molybdenum mine), the new 8.5 million ounce Blackwater gold deposit and the Chu molybdenum deposit (one of the largest molybdenum deposits in North America). The Tertiary geological elements of the Nechako Basin are part of a regional extensional system that extends from the Republic area of Northern Washington State, northwesterly for some 1000 kilometres into the Babine district of North-Central British Columbia. Epithermal precious metal showings and deposits are common in this terrane. Reference BC Assessment Report No. 23389 by Cogema Resources Inc. The Yennek area has been explored by Kerr Addison Mines Ltd., Cogema Resources Inc., Phelps Dodge Corporation of Canada, Limited and geophysical surveys have been conducted by Dighem Surveys and Processing Inc. (1993, electromagnetic/resistivity/magnetic/VLF) and S.J. Geophysics Ltd. (2007, 3D-Induced Polarization). 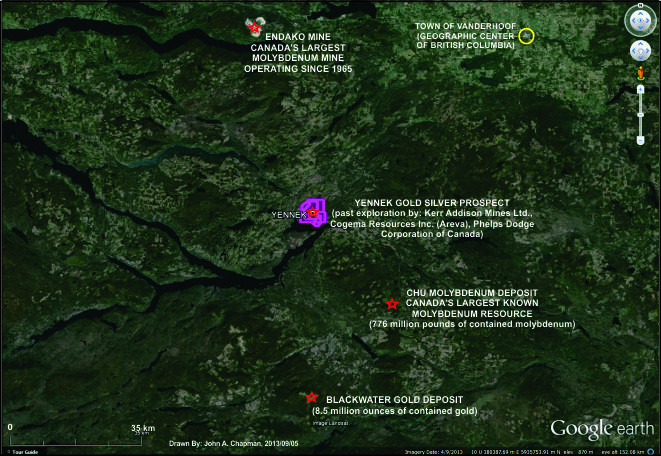 The Yennek Gold Silver Property is not available at this time.